Few tasks among a manager’s responsibilities stir up as many mixed feelings as writing performance reviews. We’ve scoured expert resources to bring you examples of how to communicate your company’s needs and encourage productivity without breaking morale. It’s easy to extol an employee’s virtues, but things get tougher when you’re faced with assessing their challenges and keeping your feedback constructive. How will you find a way to discuss areas where your employees need improvement without raising their defenses? Employees aren’t often thrilled about the performance review process, either. Employee engagement company TINYPulse and discovered that 37 percent think the process is outdated, and 42 percent feel that managers leave important elements out of their reviews due to bias. Nearly a quarter said they feared performance reviews, and the trend was especially strong among millennials, who also said the process stressed them out. Although face-to-face feedback on a regular basis is an important tool for encouraging and motivating your team, the written review gives both the employee and manager something concrete to refer to. Let’s take a look at how to write a review that celebrates great performance and clearly communicates needed improvements. There are many , and they differ from company to company. Some have grading systems. Others have question and response formats. Some are expected to be free-form. Whatever the case, commenting with clear, positive language is the key to keeping the review goal-focused and productive. A bit of psychology goes into writing a performance review that leaves both you and the employee feeling that the experience was valuable. This is where clarity of language comes into play. Let’s look at an example of the same critical feedback, one written with a negative tone, the other growth-focused and positive. Jill is always distracted and finds it difficult to meet project deadlines. This comment is both hyperbole (Jill isn’t always distracted; otherwise, she’d never get a single thing done!) and a generalization. Starting any piece of feedback with “You always do X” is bound to raise a person’s defenses and create negative feelings. It’s also not actionable. If distractibility is hardwired into Jill’s nature, how will telling her what she already knows help her improve? A focus on prioritizing tasks early in the day will help Jill eliminate distractions to better meet project deadlines. I recommend we touch base briefly each morning to set daily progress goals. This sort of feedback tells Jill that she needs to work on prioritizing and meeting goals, but it also offers a solution—a daily check-in to help her establish priorities. Assume that most employees want to do the right thing. Unless Jill’s wasting time posting selfies on Instagram, it’s likely she’s well aware of her problem with meeting deadlines and wants to get better. Rather than pointing out the obvious (Jill struggles to prioritize), it’s important to offer a solution that will work for both of you. Inc.com provides of what not to write in any employee’s performance review. The Muse offers that won’t damage your relationship with your employee. Now that we’ve examined the psychology behind phrasing criticisms constructively, let’s take a look at some sample text from employee reviews. John meets manager expectations in the role of trainer. He adapts to ever-changing client demands and works effectively under pressure. John maintains a positive attitude and acute sense of detail, but often at the expense of effective time management. John demonstrates adequate communication skills and completes all requested tasks and required responsibilities. He is very considerate of other team members and works well independently or collaboratively. John shows great aptitude for leadership, but he doesn’t seek out additional professional development opportunities. When Jack is engaged in his work, he can be a very effective member of our team. Unfortunately, there is too often a time when Jack is late to work and not fully engaged until an hour into the workday. Over the next 3 months, we’d like Jack to focus on his attendance, be on time each day and ready to work at 8:00, and be the effective team member we require. Think of giving critical feedback like making a sandwich. The criticism (Jack is often late) should be sandwiched between a positive comment (he can be a very effective team member) and some specific steps to help him improve (Jack should focus on attendance and be ready for work at 8:00 a.m. each day). 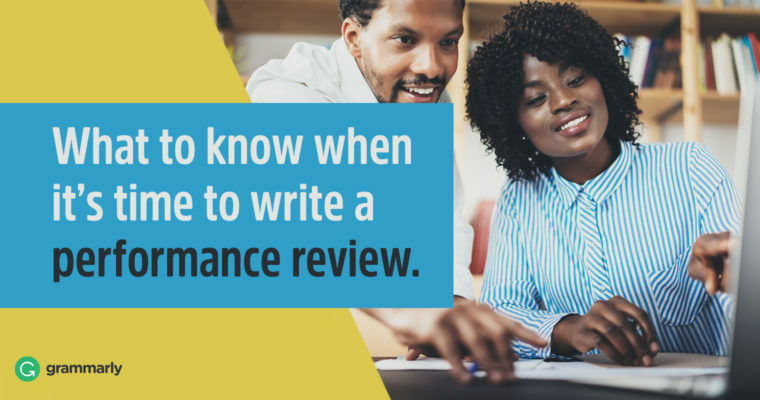 Writing performance reviews requires managers to be specific with their feedback, stay constructive, and provide solutions to help the employee grow. Pay careful attention to writing clearly, with a positive tone, and soon you’ll be writing performance reviews your employees won’t have to dread receiving.